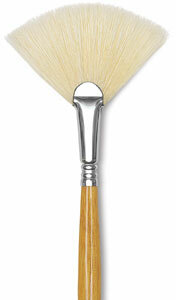 Escoda's fan-shaped Clasico Chungking bristle brush is ideal for blending and soft textural effects. 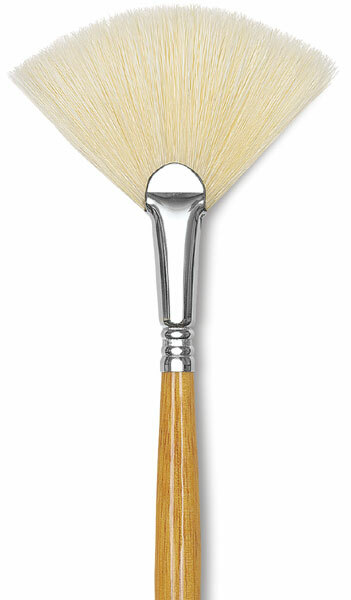 Escoda's exhaustive attention to detail makes each handcrafted brush a work of art in itself. The bristle hair is durable and stiff bodied, moving heavy oils and acrylics about the canvas with ease. Escoda specially cures each brush for increased resiliency and versatility, making it a pleasure to use. The long natural varnished handle offers plenty of control. It's attached to the nickel ferrule using Escoda's exclusive triple crimping process. The Escoda family is known for crafting some of the finest brushes available. Escoda's Classico Chungking hog hair bristle brushes are a suburb tool for painting in oil or acrylic - this video explains why.